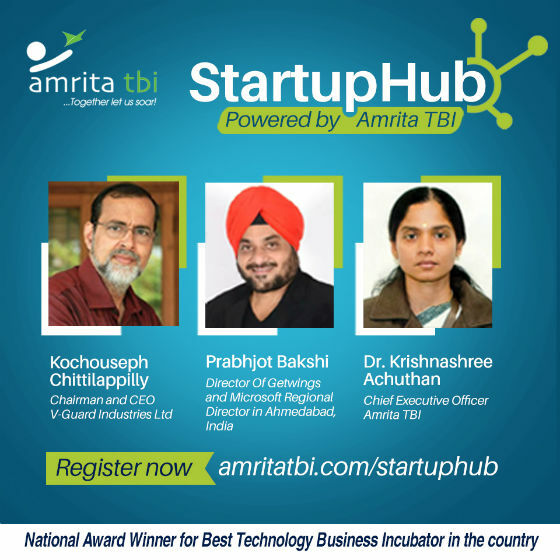 Kochi: Amrita University’s Technology Business Incubator (TBI), in partnership with Government of India’s policy think tank, NITI Aayog, will hold its first Startup Hub event at the Kochi campus on September 23, 2017. Kochouseph Chittilappilly, Founder, Chairman, and CEO of V-Guard Industries, will deliver the keynote address as the Chief Guest. Prabhjot Bakshi, Director, Getwings and Microsoft’s Regional Director in Ahmedabad will be the technical speaker of the day. The versatile event has a diverse group of experts with similar ideologies that includes Prof. Sunanda Muralidharan, Chairperson, Amrita School of Business, Kochi. Amrita University’s Technology Business Incubator recently won the National Award for being the best Technology Business Incubator in the country from the Dept. of Science and Technology, Government of India.